Announcement Welcome to Silver Aspen Studio- Jewelry by Angela McDonald. My boutique, Silver Aspen Studio, features the highest quality materials such as Swarovski crystal, beautiful hand picked gemstones, and Sterling silver as well as the highest quality plated componants for affordablilty. Mountain flair is my new favorite look, take a peek! I was an Art Major in college and have always loved to design and create through many different mediums but have found my niche in Jewelry. I hope you find something you like at Silver Aspen Studio and I would be happy to take special requests as well for any occasion such as a Wedding or even your Prom. 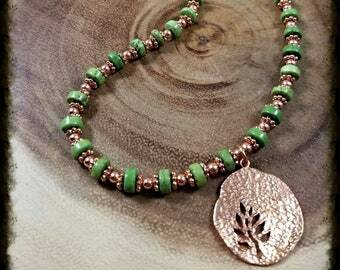 Welcome to Silver Aspen Studio- Jewelry by Angela McDonald. My boutique, Silver Aspen Studio, features the highest quality materials such as Swarovski crystal, beautiful hand picked gemstones, and Sterling silver as well as the highest quality plated componants for affordablilty. Mountain flair is my new favorite look, take a peek! This piece is absolutely beautiful. Thank you! These are simple but very classy chandelier earrings. I needed some pink earrings in my jewelry closet, and these fit the bill. The pink is a lighter shade and the delicate crystals do not overpower the earrings ( can be worn day into evening). I can see my wearing them with purple and some shades of wine/red also. Very pleased with the quality. I simply love to create Jewelry! Hi, what is it about me....well, I wanted to an Architect, after a year I fell in love with Art. Everything about it gave me the creativity without the confines of engineering. I became an Art and Business major in College, and it was only logical to have my own Studio. My favorite part is finding combinations of colors, texture and focals. I hold myself to the highest quality standards and quality components. I search at every bead shop I come across, online and try to get to Tuscan every February to personally immerse myself in everything beads, gemstones and findings! Being a tad hyper, I tend to jump around with different styles, so you never know what you may find in my little shop, or, out in the field doing numerous art and craft events throughout Colorado. In the past, you would have found me in Northern Wisconsin at local events, flea markets or in a Gallery. I recently changed my business name from Loon Song Originals, so, if you see that pop up, don't worry, it is still me! Take a peek at my shop, ask questions, and keep in mind that I also do custom work for any occasion, as well as personal pieces. I work with your choice of color and /or themes. Thank you for taking the time to learn about me and my Neverending quest to try and learn new techniques! I offer free resizing on most items. The exception is any of my hand stitched pieces which involve a lot of time and usually cannot be resized without completely destroying the piece. In the case of wraps and cuffs I stich, many times I can make one for you or use very similar colors and materials. Feel free to gift away and let you recipient know that simply sending the item to me, at a very small charge from USPS, I will resize and return at no charge in almost every circumstance. I happily accept custom requests. As with any jewelry, keep it clean by simply using a polishing cloth. If it is seldom worn, storing in a zip lock will keep it looking new until next time. If you have questions about the care of your pie e. Feel free to ask me for my recommendation. I, the seller am not responsible for lost, damaged, or stolen packages. If an issue arises, please be sure to contact your local USPS office for information on your parcel. Tracking will be emailed if you have provided an email address at checkout. No exceptions. I ship via US Postal Service First Class for domestic shipping. International packages are sent out via USPS First Class International Mail with a customs form attached. It is the buyer's responsibility to pay any tax or custom duty levied by their country to receive the goods they import. If for any reason you are not aware of this & wish to cancel this transaction, please let me know within 24 hours of placing your order and I will be more than happy to cancel your order.